It’s 01:30 in the early hours. Istanbul airport is teeming with people from all corners of the world as Turkish Airlines continues its March towards being the biggest airline in the world. For premium and economy passengers alike, Turkish Airlines on board service is regarded as one of the best in the world and certainly the best in Europe for the past few years. The premium lounge has won awards for its design, food and drink offering and its facilities. Thus if a premium customer could teleport direct from the plane to the Lounge and vice versa, Turkish Airlines would be close to top of the tree. But there’s a problem. A big problem. 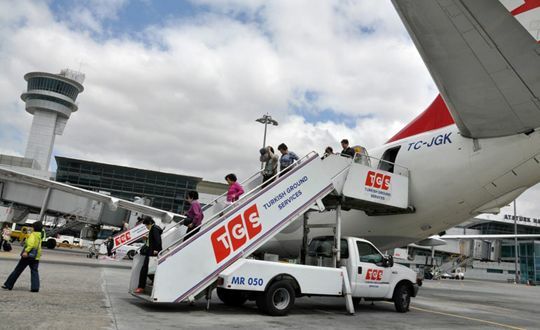 Turkish Ground Services (TGS) that handles TK flights at IST is an ugly and unfriendly face of the airline. Granted, part of the problem is the chaotic nature of the airport itself – it’s not unimaginable that the work atmosphere is stressful and unfriendly as IST is clearly at its operational limits and TK desperately needs a new airport. Turkish Ground Services (TGS) is the ground service arm of Turkish Airlines. It is an operational joint venture, together with ground service company Havas in business since 2010. But I think there are two deeper and intangible aspects that renders the ground experience for passengers less than ideal. First, the training of ground staff is clearly inferior to the onboard crew. And presumably this is related to the levels of salary of the two units as well as the job prestige in either case. Investing in customer-centric training could help substantially. Second, TGS’ customer is not the paying passenger of the airline but an internal supplier of TK airlines and thus the indirect relationship between the passenger is mediated by a service level agreement that doesn’t focus on customer experience but on operational processes. A case in point. All boarding passes indicate that the “boarding time” is 1 hour ahead of departure. In practice, almost all of TK’s short and medium flights rotate in less than one hour thus it would be physically impossible for a passenger to board before a plane is on the ground! In practice – flights begin boarding around 30 mins before departure. I asked a gate agent why we are told to be boarding 1 hour before departure and was informed that this was “expected” boarding time. At the gate was a long sad line of passengers lining up to board. Not a single announcement was made by the gate agent informing passengers that they should come back to board in 30 minutes. When I asked why no such announcements are made, I was told that “this is the procedure”. Needless to say, you can see that this conversation was going nowhere. Reducing the boarding time requirement to 40 mins before departure. Accessible and meaningful customer feedback loops – at the moment when a customer is unhappy with TGS, they are told to complain to TK. Yet TK staff state that TGS is a different company! Aggressive targets for staff training requiring improvements in a short space of time. A boarding protocol that is documented or even recorded digitally requiring ground staff to make announcements at critical moments in the boarding process such as when they first set up at the gate – a welcome announcement informing customers of the expected process; a preliminary announcement prior to boarding and frequent updates on when the process begins and ends. None of this is rocket science. Yet it points to a fundamental management issue: aligning a customer centric culture with operational excellence. It also has huge strategic implications – as airlines onboard services becoming increasingly copy-pasted by airline executives, distinctiveness comes at a premium. If TK wants to be the #1 airline in the world, it must stand out on the ground as well as in the air. Time to roll up the sleeves and get on with it. PreviousFalling Oil Prices: Do they really help airline performance?